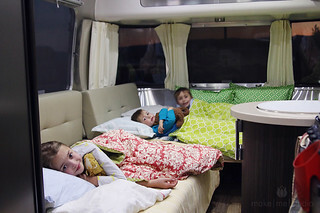 We recently bought a 23D and just got back from our first weekend trip with three kids, ages 5 to 10. I feel like we are very much in the minority having picked the 23D for this many people. We wanted the smallest trailer that would meet our needs. Eventually, as they get older (bigger) we'll probably be taking a tent with us for whoever wants that option. The 23D has a good layout to sleep a couple more people, or in our case, three little people, but it has zero counter space. The sink is immediately adjacent to the stove. There is a little space behind the sink and on top of the sink with the cover and of course you can work on top of the stove if not using it but you have to think about how you are doing things. The other consideration with the 23D and more people is that they were lining up by our bed to go to the bathroom first thing in the morning since the bathroom is right next to the main bed. There is not a lot of easily accessible storage space for people's clothing after the first two. My kids are little so they are not terribly demanding in this area. They just used the floor cubbies under the bench. But truth be told, I had nothing stored above the pantry cabinet, so that could be used for clothes too. The fridge also has an integrated freezer as opposed to separate freezer as in the 25'. I thought this might be a problem for us as we need to bring a lot of food for five people but it totally wasn't. And as silly as I thought it was to have a microwave above the fridge, we did use it several times. I think it's a hard choice between the 23' and the 25'. The 25' definitely fixes all the little issues that the 23 is not able to satisfy including the back facing dinette which I would have much preferred for back-in sites. On the other hand, it doesn't provide any additonal sleeping space over the 23D after the first two people. And in the photo above, where we spent one night in primitive camping, we have a great front view of the sun setting over the lake. However, for us, the choice was simplified as we did not want to get a new TV and the 23D was at the max of the weight limits for our 2006 LR3 V8 loaded with five people, two kid kayaks, gear, and possible bikes in the future. I think it would be too crowed to have as many people as we do in there all the time. Our thinking is that we want to use it to go places and explore, not really to go somewhere and sit in it all day. On this first trip, we were at a full hookup site by the lake and planned to cook some meals inside but eat on the picnic table at the site. We were not able to spend any time outside at the camp site due to mosquitoes. So we ate all our meals inside and aside from kids that won't sit still sometimes, it worked out fine. They sat on the dinette and played cards while I made dinner at the little kitchen and it wasn't a problem at all. In my opinion, the 25 is definitely more spacious but the 23D is easier to tow for us, size is working fine and we've already ran across campgrounds that will not accommodate larger than our size so we're pretty happy with it. Water capacity: Hands down, the 23 is better. The 22's grey water was full after two standard (non Navy-styled) showers, and the black water was good only for a three-day weekend. I carried a "blue boy" external waste tank when not on sewage hookup. The 23 has the larger standard FC series capacities, and another 10 gallons can go a long way. We rarely use onboard water, preferring full hookups, so I can't give you a good freshwater usage assessment. Comfort/Space: The narrower center aisle meant one person passing through the cabin at a time. We always felt were were bumping into one another! You wouldn't think 6 inches is a lot more room, but livabilty-wise, we found it so. 23 has much more cabinet space! Locker type doors versus the famous rolling tambours. The roll out pantry alone was a big storage upgrade. The 22's single closet was a problem. We had to pack light, but never got over one good hanging space and one shelf. In the 23 we each have our own closet, and our own drawer in the sleeping area. And a real bed with a small aisle around it: waaaay more comfortable for us. Cross flow: Pleased with either. The 23 has two Fanstastic Fans versus one in the 22, but windows open and high fan speed was comfy and useful in both rigs. Overall Appointment: The perceived FC quality is higher. More neutral, more wood-look. The newer 22FB is a definite step up in looks and finishes from the original model we had. But having looked at the 2015s, I see much less difference in the perceived "low end" look of the Sport line. Towing: the narrower body 22 definitely had less wind resistance, and towed easily behind a medium-sized SUV. The 23 has about another 1200 dry weight pounds, so I will notice it on a long uphill grade. But my average (diesel) MPG only dropped about 0.5 MPG. Best wishes on your choice! I did not read all the new posts but another consideration is the 26U. I find that floorplan appealing if the seats are comfortable. I hope they have one at JC when I go up in a week or so. Basically they have addressed the seating and bedding need for four adults and supposedly enlarged the bath. I have not been in one so I do not know of compromises but it looks very promising. Are you getting closer to making a decision? I have gone over floorplans that Airstream has used to see how they have addressed certain things. Example, my floorplan was used for 23 years or so in various model lines. They later moved the shower door to the hall to offer a wider opening and slightly larger bathroom. Now, they seem to be moving toward putting the bathroom together again, at least in the last two designs. I believe you need to get into some different models and see what works. I find that realizing the size makes a big difference. I like multi-use functionality and so I look for that. Go look at some units. All your options and considerations are great ones. I think the only guarantee that you would never be sorry with and never look back on your decision is to go with a 25'. It is by far the most versatile layouts and length for weekends, boon docking and extended stay. I would suggest you consider two options in the 25': first, twin beds. Second, Rear Birth (RB) instead of the front birth. Due to the location of the wheel wells it punishes you with interior and exterior storage on the 25 FB. The RB option maximizes your interior space, especially bathroom ( bigger than many 27') and storage above the refrigerator, not just a little but a lot. Also the RB takes you to 4 larger exterior storage bins vs 2 in the forward birth. I won't repeat what others have said in the thread, but if you have a V8 tow vehicle, the 25' is a Wide AS, to me this is more important than length sometimes. Good luck! Excellent info... we are looking for an AS and recently joined this site. We have decided on a 25 twin, but wife is leaning toward the longer lounge seating and sleep area (for grandkids) of the FB version while my choice is the storage advantages of the RB model. I'm assuming that both showers are the same size as the AS site does not include dimensions on their floor plans views. Used would be nice, but they are rare..... and we're a long way from a dealer of any size here in Iowa. We purchased a very lightly used 2015 Sport 22. We have been out for 2 weekends, with the 2 of us and the large dog. The 22 is a great layout. Love the large bed. Very comfortable for both of us. I used standard queen size sheets and comforter, and these fit great. I don't find it difficult to make the bed, as others have mentioned. Just kind of squish the extra comforter around the lower curve area by the front windows and tuck between the mattress and wall. The kitchen layout is really good. Lots of counter space, and very good storage underneath the sink area for all of our dishes, glasses, silver, spices, clean up items, etc. I found a great dish pan/strainer combo at Ikea (see separate thread in the Bambi trailer section). It fits IN the sink and still allows the faucet to be used, has handles for taking outside, and stores our dishtowels when traveling. Bathroom works well. Has enough storage for our towels and toiletries, and enough floor space to stand and towel off or use the sink/mirror. Sound system is really nice. We just crank it up a bit and it's loud enough to hear outside even with windows and doors closed. So far a great choice for us. Super easy to tow and hitch/unhitch. We selected our AS because it had both a dinette and a sofa. Our model is called a six-sleeper because of this. We have a nice double bed and the dinette and sofa both convert into 2-person sleeping spaces. 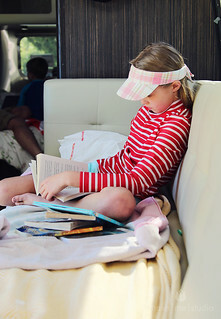 We've never had that many sleeping in our AS, but having the option of sitting at the dinette or sofa makes a huge difference when we're hanging out inside our trailer. We looked at models that had only a dinette or a sofa (not both) and knew right away we would be too cramped inside with those seating limitations. Great notes. I'm thinking about getting an Airstream. I've been leaning towards the Sport 22. But, the FC 23/25 both look good. Thanks for the info. Greg, you picked up on the storage benefit of the twin rear. Yes, it is an advantage. Another advantage is the use of the bedroom as a multipurpose room as well- dressing room, sitting area, etc. The locker storage access is much better too. I find that with the twin layout you can utilize the trailer end to end, in effect, getting the space of a larger big bed AS. In our 2015 23D, we added a flip up work area beside the sink. We had converted the dinette top to Hickory and also used that on the side work area. There are two doors below the curb side closet and pantry. We installed matching handles and blocked off the front wall side of the front area and the rear wall of the rear area creating useful storage above the wheel well. The blocks keep stuff from moving forward under the oven or rearward under the bed. I have my tool bag in that space as it is above the axles. This maybe shockingly crazy but we are thinking of downgrading in size from the Int 27FB to the 23D. (Why is the 25' MSRP around $15K more than the 23???) Crazy because about 75% of the time its me along with 3 daughters and now a yellow lab too. When the wife is not traveling she comes along too. The past two years we have covered (Live near Portland Oregon) from Jasper NP up North to Yellowstone to the East and down to Redwoods NP to the South with tons in between in the 27'. The issue is for many campgrounds this is a big rig (28' tongue to bumper) and found it very stressful in campgrounds getting around while coming very close to trees, trying to squeeze into spots etc. Out here in the West there are a ton of National forest campgrounds that surround crowded National Parks, these offer more campgrounds as well as boondocking but manipulating 28' of aluminum down these roads is not fun and backing that thing up is something you just do not want to do. If there is a place to unhitch and leave the trailer unobstructed we will do that and do some recon ahead. However even that is perilous because you might need to turn the trailer around where you left it so there better be enough room. I have noticed in the past five years of camping in the West it has gotten significantly more crowded and the only available spots might be off the beaten path which with a 23' would be more manageable. Exactly why we now have a very customized 2015 23D International Serenity and plan to leave the 2014 31' Classic during most of the summer on our lot at an Airstream only camp ground called Ponderosa Shadows at Lakeside,AZ. It was a real challenge to get the 2013 25FB International Serenity into our space at Joshua Treen National Forest towing with our 2012 Ram 2500HD. We use that truck now to tow the Classic and my 2007 Mercedes Ml320 CDI diesel to tow the 23D. The Mercedes and 23D make a very maneuverable rig in tight spaces. We purchased the 22 Sport because it's lighter and easier to tow. Our TV is the Tundra. There is only the two of us and we don't spend too much time inside the trailer. If others join us, we have a tent and they can use the AS facilities if needed. We also have the Clam screen room for lounging and staying away from bugs. The larger units appears to benefit those wanting to enjoy the trailer from the inside. The larger units appear to benefit those wanting to enjoy the trailer from the inside. This is so true. We're in a highend RV park (rare for us) that's filled with large and expensive motor homes. It's interesting to observe that most of the MoHo occupants never leave their rig and there is no gear set up in the site. I guess they watch TV or something. When we arrive we immediately spill out into the site: chairs, tables, mats, checkered table cloths, barbeque, flower bouquet (a must for my wife) and of course the flamingos. Must look like the Grapes of Wrath to our MoHo neighbors.